Following on from the BBC’s recent Panorama documentary on SSRI’s causing violence in some people, a series of articles defending the use of SSRI’s appeared in the media. One of the commentators (who also appears frequently on twitter defending the use of SSRI’s) is Dr Carmine Pariante. Pariante is a psychiatrist, from Kings College London, and judging by his tweets he seems to believe firmly in the bio-medical/brain disorder approach to depression and ‘mental illness’. He also seems to have no problem accepting funding linked to various pharmaceutical companies. Psychiatrists linked to drug companies (or just taking money from drug companies) are nothing new; it’s the norm. This kind of intrinsic conflict of interest is widely accepted in psychiatry. Psychiatry is awash with pharmaceutical money and influence, and has been for a very long time. Conflicts of interest are important, but in relation to this post, they don’t interest me that much. I find it interesting that it is stories like Martha’s (above) that get completely ignored by mainstream psychiatrists like Carmine Pariante. Pariante would likely dismiss Martha’s experience as ‘anecdotal’. He would probably attempt to link her Seroxat side effects to her ‘mental illness’ as opposed to highlighting any real serious problems with SSRI’s themselves. Pariante has faced a backlash of commentary, about his pro-SSRI views on Twitter, yet in most instances he fails to even respond to views that don’t concur with his own. He seems unwavering to any opinion that does not tally with the consensus of the royal college of psychiatry, and incidentally- the drug companies. Why is Pariante so unwilling to engage with people who have had serious adverse effects of SSRI’s? Why is he so fixed in his views, why is he also unwilling (and seemingly unable) to listen to our experiences of the drugs that he promotes? Why does he ignore different opinions? Could this have anything to do with his declared interests with the drug companies who manufacture (and profit off) psychiatric drugs, or is it merely because his psychiatric reductionist world-view has become utterly blinkered from his total immersion in the ‘biological brain disease paradigm’ of depression and mental illness that maybe he can no longer see the wood for the trees? Maybe he needs to listen to his patients more? Pariante states, in the Standard article, that antidepressants stimulate the birth of new brain cells and that they ‘regulate’ stress hormones, he also says that the chemical imbalance theory is too simplistic…. “…Experts argue that the ‘chemical imbalance’ theory is simplistic. Professor Carmine Pariante of King’s College, London, tells me: ‘The action of antidepressants is more complex than that and involves stimulating the birth of new brain cells and regulating stress hormones.’ However, it’s a shorthand that makes sense to many.”..
Psychiatry and drug companies sold people millions of SSRI’s in the 90’s and 2000’s on the basis that SSRI’s (like Seroxat) fixed a ‘chemical imbalance’ in people’s brains, and it was this imbalance (so they claimed) that was causing the person’s depression. Now, it seems psychiatry is trying to distance itself from the theory- is this perhaps because the theory itself was little more than a pharmaceutical marketing ploy? a fraud? a fairy-tale sold to vulnerable people in order to get them to take mind-bending pills? Who is going to tell all those millions of people who took SSRI’s, that psychiatry has now abandoned the chemical imbalance theory? Who will tell them that they were duped? Will Pariante do it? Whilst dispelling one myth (the chemical imbalance theory) on the one hand, Pariante seems to have no problem planting outrageous new ones (such as SSRI’s regulating stress hormones and making new brain cells) into the discourse about SSRI’s, in the media. You’d have to wonder, with folks like Pariante (considered ‘experts’) as part of the ‘authority’ on mental health, are patients being harmed or helped by these kinds of glib pseudo-scientific statements? Personally, I would like to see the evidence that SSRI’s regulate stress hormones, I’d also like to see hard evidence that SSRI’s creating brain cells is a good thing (where in the brain do these ‘new cells’ appear – for example). It wasn’t long ago that psychiatry was telling us that homosexuality was a mental illness. Psychiatry changes its theories like the weather, it depends on which way the ‘consensus’ is blowing. It also depends on who is feeding the ‘consensus builders’. The consensus is now being altered by the internet, and patients voices (on twitter etc). No amount of ignorance from people like Carmine Pariante can quell the tide of change that is now happening online. Is it time for psychiatry to reform? GSK’s Tafenoquine Scandal Hitting The Mainstream…. Schizophrenia, hallucinations, seizures and self harm are among the disorders allegedly affecting Australian service men and women who trialled controversial anti-malaria drugs. The drugs were given to the military personnel from 1999 to 2002 while deployed to East Timor and Bougainville as part of international peacekeeping missions. The precise numbers who received them is uncertain, but campaigners say one drug, mefloquine – also known as lariam – was given to about 1300 servicemen and servicewomen. They believe another experimental pharmaceutical tafenoquine was issued to 1500 members of the ADF. Some veterans insist they were compelled to take the drugs. 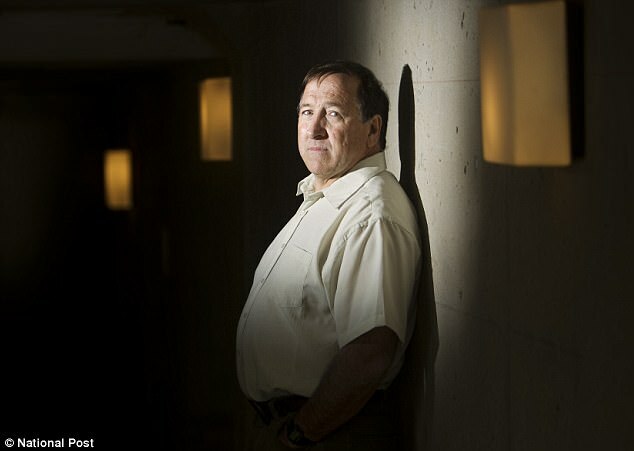 While the Defence Department says only a small number of veterans have suffered adverse serious effects, there is speculation that hundreds of Australian military personnel may have been diagnosed with chronic brain injuries and psychiatric conditions. These effects can often be mistaken for post-traumatic stress disorder. Some veterans who took the drugs have reported suffering bipolar disorder, schizophrenia, major depression and anxiety, seizures, hallucinations and psychosis, suicide attempts and suicide. 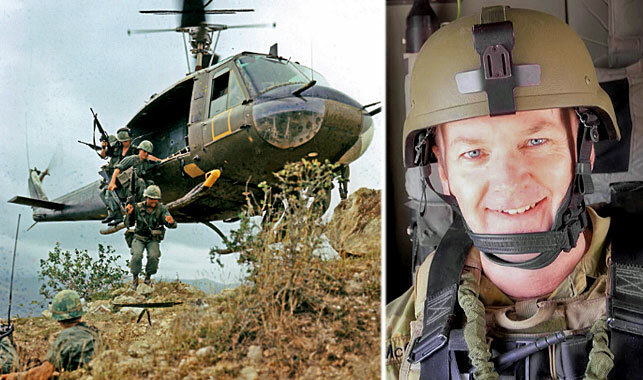 Major Stuart McCarthy, right, is being treated for an acquired brain injury after being exposed to mefloquine, developed by US army doctors during the Vietnam War, left. (Main photo: AP). Melbourne-based veteran Mick Kruizinga was given tafenoquine after contracting malaria before being given mefloquine on a second tour of East Timor. The 41-year-old former infantry man has since experienced severe health problems. “The last eight years he has had major problems and he is getting worse,” his wife Naomi Kruizinga told nine.com.au. She said his health problems include lesions on his brain as well as high toxicity in his blood system. But the Kruizingas have received little from the Australian Government, with Mick being refused a Gold Card – which entitles holders to health care treatment funded by the Department of Veteran Affairs. Instead, the family have paid for Mick Kruizinga’s costly and lengthy medical treatment themselves. 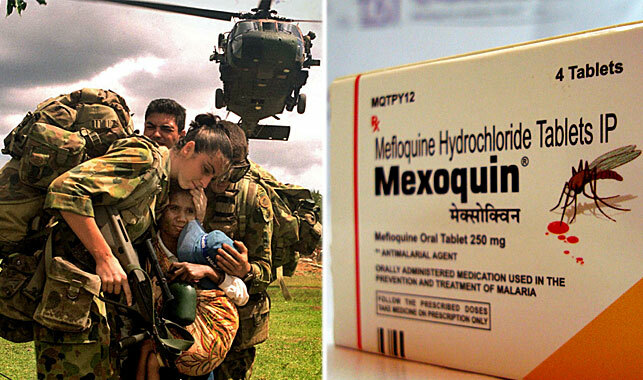 Australian soldiers serving in East Timor during 2000 to 2002 were given the anti-malaria drug mefloquine. (Photo: AAP). Campaigner Major Stuart McCarthy, who is undergoing treatment for an acquired brain injury after being exposed to mefloquine and tafenoquine, claims the ADF trialled the drugs on a “captive audience” of volunteers. McCarthy whose overseas service included the Middle East, Africa and the Asia Pacific, told nine.com.au he volunteered to take the drug while deployed in Bougainville after a “sales pitch” by a high-ranking army doctor. Last week, the Repatriation Medical Authority – the government body that determines Statements of Principles for any disease, injury or death that could be linked to military service – dismissed any relation between brain injury and antimalarial drugs after a government investigation. The authority ruled there is insufficient evidence that exposure to the antimalarial drugs mefloquine, tafenoquine or primaquine causes chronic brain injury. Retired Colonel Ray Martin said the decision was disappointing. He told the Townsville Bulletin: “Sadly it often takes decades for the devastating effects of toxic substances to be fully recognised”. 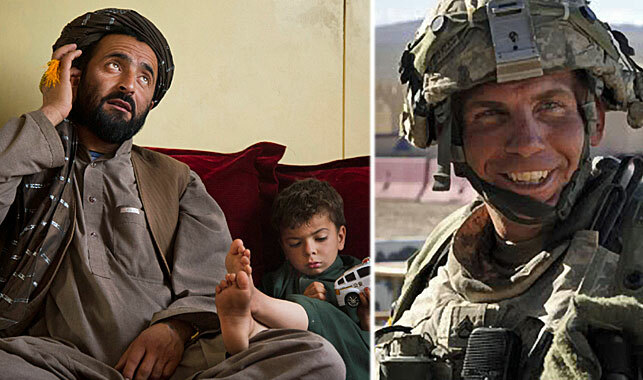 A file photo showing survivors of a shooting rampage by US soldier Robert Bales in 2012. This month he asked a military court for a special hearing to explore evidence his actions were linked to taking mefloquine. (Photos: AP). Mefloquine and tafenoquine were developed by the US military’s anti-malarial drug program at the start of the Vietnam War in the 1960s. By the late 1990s mefloquine was known for serious side effects and ceased to be produced in many countries. It has been linked to many murders, suicides and war crimes over the past two decades and is now used as a drug of last resort by the ADF. Earlier this month, US Army Staff Sergeant Robert Bales who was convicted of killing 16 Afghan civilians during a shooting rampage in 2012, asked a military court in Virginia for a special hearing to explore evidence that his actions may have been linked to mefloquine, reported the New Observer. Last year an inquiry by the ADF’s Inspector General reported the “drug trials were conducted ethically and lawfully”, that soldiers volunteered to participate, and that anyone who was sick could be treated for free. But today the effects of the anti-malarial drugs on service men and service women from a range of countries is under renewed scrutiny. Concerns have sparked a number of high-level inquiries being held in the US, Canada, Germany and Britain. Germany has gone as far as banning the use of mefloquine. Dr Jane Quinn, a neuroscientist and neurotoxicologist at Charles Sturt University in Bathurst NSW, who moved to Australia from Britain, has expert knowledge and a tragic personal link to the issue. Her late husband Major Cameron Quinn, a British Army officer, was given mefloquine during a training exercise in Kenya in 2001. She told nine.com.au he suffered depression, nightmares and long-term personality change for years before taking his own life in 2006. Dr Quinn subsequently campaigned for mefloquine to be axed by the British armed forces. Since moving to Australia, she works as a senior lecturer and helps veterans and their families confront the debilitating effects of the drug. “After taking Lariam my husband was a changed man forever. He went from someone who had never had any mental health problems to a man who started to suffer bouts of suicidal thoughts, depression, anxiety and volatile behaviour,” she said. Dr Quinn is certain the controversial drug was behind his death. “I am convinced that the side-effects of Lariam killed my husband. Since his death I have become aware of many other soldiers who have suffered dreadful psychological problems after taking this drug. Some of you may have watched the Victoria Derbyshire programme on Wednesday this week (19th October 2016) from 9.00 am onwards. She presented a report by a researcher into the effects of anti-depressants. Claire, who first took the SSRI Seroxat whilst studying for her degree and caring for her unwell mother, immediately felt terribly ill on the drug, and was later hospitalised, having seizure after seizure. We also saw ‘Darren’ (not his real name) unable to stop the muscle involuntary judders, in extreme akathesia. I write this here because after taking RoAccutane/isotretinoin to hopefully clear his acne (it didn’t, by the way, diet and Blue light treatment and laser therapy eventually did), but I digress. After the low mood which so many people experience on taking RoAccutane, (as well as many other horrendous side effects which are listed on our Olly’s Friendship Foundation site under ‘RoAccutane’), he was given Seroxat, an SSRI, to lift away his dark thoughts. This drug had the same effect on him as it did on Claire, and thousands of others. He was overwhelmed with suicidal thoughts. He was never his old cheery anxiety-free self again, although for 11 years he made a brave attempt to cover this up and put on a good show for his friends. He was given other courses of RoAccutane and other SSRIs and antipsychotics intermittently over that time. On Victoria’s excellent piece, many sufferers had sent in their stories. Katinka Newman spoke movingly about what had happened to her, and how she nearly died like Olly but was just lucky in that she was suddenly taken off all her meds because she was moved to a different hospital. Dr David Healy, Professor of Psychiatry at Bangor University explained how seriously under-estimated the problem is for people taking these SSRIs when they react badly to them. Half the people who have them prescribed stop taking them early on because they feel so ill. Others are not so lucky. Like Olly and others on the programme, they appear to be suddenly psychotic. They are not. It is the drug. But then they are treated as though they are mentally ill and MORE drugs are fed into them. They get worse and worse. You couldn’t make it up, could you? It is simply so terrible, and even some family members don’t understand, and ostracise you. Now, GSK who make Seroxat, know perfectly well what terrible effects their drug can have on many many people. Google ‘Study 329’ for insight into the mammoth cover up about this. Back in 2003 this issue was raised in Parliament. A bit of tweaking went on. The MHRA were asked to look at things. And guess what, folks, here we are 13 years later and sufferers have again gone to Parliament with their concerns. It’s actually rather like all the times over a period of 30 years that concerns have been raised in high places about RoAccutane/isotretinoin and Roche who sold it. But little has changed. Lots of people like Olly are dying, because they trusted medical opinion. And we have to assume that medical opinion is conveniently based on what the drug companies have convinced them of. Olly died, believing he was a loser, to blame for the terrible tricks his mind was playing on him. The Home Treatment psychiatrist actually told him that too. But he wasn’t. His many friends knew that. So did we. It was the drugs, right from the start. But poor Olly believed the power figures, the doctors. He fell into the Stockholm syndrome, totally. A GP on the show, Dr Sarah Jarvis, gave a very plausible account of how useful anti-depressants are in saving life. She played down the stories of terrible anxiety, akathisia and suicide by implying that of course these sufferers ‘may have had complex issues’, in other words, be comforted dear viewers, these things are very rare so surely unlikely to afflict most of us because those reporting them could be unreliable, to put it kindly. But Professor Healy says no, it is more like 1 in 4 who take them become very very anxious and far far worse than how they started. Trying to see Dr Jarvis’ dilemma, just think about it. You are feeling very down, for some reason, life is getting on top of you, so you go to the doc for some relief of anxiety or sleeplessness. They have got 7-10 minutes in which to help, make a difference. They will listen kindly (we hope) but all they have to immediately offer is medication. Once on the pills, if you react like Olly, you are now manifesting madness. So you need more meds to calm you down or lift you up or whatever. The meds however, seriously mess with your brain. In some cases, that brain never mends itself properly. So SSRIs need to be evaluated VERY carefully by all those who consider taking them. Weigh up the risks against the benefits. It is, as with RoAccutane/ isotretinoin, like Russian roulette. I cannot bear to think that Olly died blaming himself and carrying the can for the appalling ineptitude of doctors, duped by the subterfuge of the drug companies. His wish was that we should help others like him. In a few days’ time, it will be 25th October, the day 4 years ago when so many of his friends and family came together in Worcester Cathedral to say goodbye to him in this life. We, his parents, who loved him so much, and fought to the very end to save him and to get those in charge to listen, we feel we MUST do something, and fast. We have to get together in little supportive groups and care for each other, talk through worries, offer ideas on how to live happier lives. GPs and psychiatrists can’t offer the time that we can all give each other. They can mostly only offer ‘quick fixes’. Amazingly the NHS spends £780,000 PER DAY on these medications! Just think what that money could do if used for one-to-one psychological support, and on lovely centres where people could go, rest, be creative, appreciate nature, and stop the world for a while. And above all, be listened to with empathy. Please watch the Victoria Derbyshire programme. Please look out for yourselves and your loved ones. Please realise that we can heal our lives if they feel broken, by reaching out to each other and caring. Please analyse carefully all you are told about risks and side effects before you ever swallow any drug. Olly took Seroxat in 2002/3, at the very time concerns were being raised with Government. Plenty of agencies knew the dangers. But no one dared join up the dots for him. And it was swept under the carpet ever after. So much easier to tell him he had ‘brought it on himself’. So much easier to discount withdrawal symptoms as lack of co-operation. Surely this is dastardly behaviour of the very worst kind, inflicting torture on already vulnerable desperate people. “…I certainly agree with Truthman. I was first to file in the GSK 3 billion dollar case, in spite of 5 later filing copy cats, claiming to be whistleblower. Although the company agreed to criminal as well as civil charges, nobody went to jail, or even faced personal charges. The liberal deep state Department of Justice gave them all a pass, after almost 10 years of secret negotiations, sealed illegally from the public, while more patients died, and suffered from illegal marketing and outright bribes. If you want to know who the criminals are, look no further than the so called investigation leaders…they refused to take this to trial, and gave GSK a pass. The pass AMOUNTED to 3 months if company profit, which was easily made up illegally while the govt prosecutors kept the case sealed. There SHOULD be a price paid for this quid pro quo under the DOJ led by Eric Holder, a defense attorney for the company, before and after the case. The revolving door syndrome from private practice, into the government and back again….to a hero’s welcome is proof enough , in my mind that Holder did not fully recuse himself and pulled the strings on this 10 year charade. We will see…some DOJ insiders need to come forward as I did, and not hide behind what was the largest fine in history, but the biggest gift in history. The fine, with no criminal repercussions to company leaders like Bob Ingram and JP Garnier, was a pittance and a joke. But I am not laughing. This took 10 years of my life, my job and in the end the criminals at GSK win. Paxil/Seroxat Implicated In Drugged Driver’s Crash..
Other under-reported side effects of SSRI’s like Paxil/Seroxat are motor-retardation and sedation. How many crashes and accidents can be attributed to SSRI’s? He was charged with operating under the influence after a crash in Brockton – but it wasn’t related to alcohol consumption, police said. BROCKTON – A Middleboro man was charged with operating under the influence after a crash in Brockton – but it wasn’t because of alcohol consumption, police said. Jacob R. McMahon, 25, of Middleboro, was charged with negligent operation of a motor vehicle, disobeying motor vehicle rules and regulations, and operating under the influence of drugs, after he crashed into a parked car in Brockton on Sunday night, according to Brockton police. At first, McMahon tried to drive away, but heavy damage to his Volkswagen Jetta stopped him from doing so, following the collision at 282 Green St. at 11:22 p.m., Brockton police said. McMahon hurt his head during the crash, police said. “He said he struck his head on the windshield,” Hallisey said. McMahon was not arrested and was instead issued a summons, and he was transported to Good Samaritan Medical Center for treatment and testing. 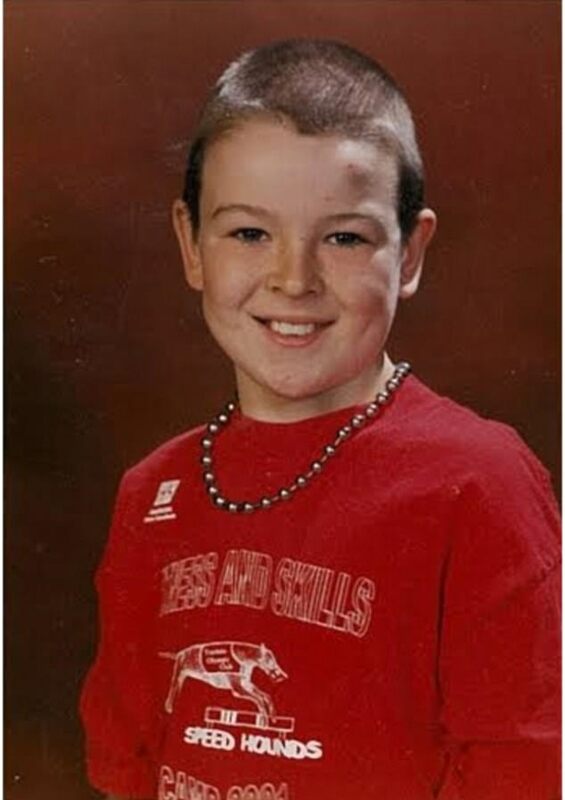 Hallisey said that McMahon was expected to be tested for drug use as part of the ongoing investigation. Psychiatry Has Destroyed Sinead O’ Connor..
Irish singer, Sinead O’ Connor, has hit the headlines again, with an impassioned and heartbreaking cry for help to her family through an online video. In distressing and harrowing Facebook posts over the last few weeks, Sinead has been crying out for her family to reach out to her. From the videos and messages she has been posting for almost two years now, it is obvious that Sinead is in a very bad state, and has been for at least a decade, but what has her led her to this crisis? How did one of the most talented, and famous, female singers- in the world- end up alone, isolated, and severely ‘mentally ill’ to the point of suicide, in a motel in the outskirts of New Jersey? Sinead, now 50, has been ‘under the care’ of psychiatry (that’s if you could call it ‘care’), and under the ‘treatment’ of psychiatric drugs for years, and if her recent video is anything to go by, the effects of this (mis) treatment have utterly destroyed her mental and physical health, her relationships with family and friends, and possibly her career, and her life too. Sinead is one of milions (globally) destroyed by the polypharmacy medication merry go round of psychiatric drug treatment. Those of us that have been through this system of psychiatric drugging and mis-treatment (and suffered side effects which made our condition worse), know all too well the dire consequences of it. It’s difficult to see, or to understand, the damage been done to you while you are in it. The meds keep you sedated, and suppressed, so much so that you can be completely unaware. Tragically, people like Sinead end up stuck in the psychiatric system, not realizing that the system itself is damaging them, but so vulnerable that they are helpless to get out of its grip. “….Here’s a recent clip of Sinead O’Connor speaking on her treatment by an Irish Psychiatrist. Sinead says that she was misdiagnosed with Bipolar Disorder and subsequently prescribed ‘toxic’ doses of Lamictal (400mgs) and Amitriptyline (200mgs). She describes her psychiatrist as a horrible ‘b’ who did not inform her of the side-effects while on the drugs, or while coming off them. In the video above, Sinead seems to be aware that the medications she’s being prescribed are toxic, as she details the various side effects she has had over the years, however it seems that she is stuck in the psychiatric system, without realizing that it is in fact- the psychiatric system that is the problem. “They are extremely debilitating drugs. Tiring to the extreme. Ironically, extremely depressing. They can cause suicidal or self-harm type thinking. They can mess up your menstrual cycle very badly and cause you to be incapacitated for a week before. Sinead will only get better when she gets away from the psychiatric system and the regime of drugging that the psychiatrists subject patients to. The psychiatric survivor movement is now global, and I hope that Sinead doesn’t end up just another casualty of mass psychiatric drugging. I hope she gets off the psych drugs, and then she can start her journey of healing. If you haven’t heard the song ‘Troy’ from Sinead’s first album – The Lion and The Cobra- you really should, it’s spine-tingling. It’s Sinead at the height of her creative power, only 19 at the time. Compare that with the video from her facebook cry for help -above (30 years later), and bear witness to the damage that over a decade of psychiatric ill- treatment and psychiatric drugging does to an individual. This One’s For Mr Thorpe..
UK fraud office expects decision on GSK Case Next Year..
I’m going to make a prediction about this.. I think that the UK Serious Fraud Office will either let GSK off the hook completely (due to some technicality of law or loop-hole) or GSK will get off very lightly (a slap on the wrist). Either way, I would be extremely surprised if justice is adequately served. In a just world, one where corporations like GSK don’t get to operate above the law- the top executives at GSK would all be in jail. However we don’t live in a just world, we love in a corporate driven world, one where corporations get to decide on what laws they can break at a whim, with little consequence from the establishment or the authorities. LONDON (Reuters) – The UK Serious Fraud Office (SFO) said on Thursday it expects to decide next year whether it will file criminal charges in bribery investigations related to drugs giant GlaxoSmithKline (GSK.L) and aero engine company Rolls-Royce (RR.L). The SFO launched an investigation into GSK and its subsidiaries in 2014. Britain’s biggest drugmaker has already been fined a record 3 billion yuan ($452 million) by Chinese authorities for paying bribes to doctors to use its drugs. The SFO’s continued investigation into Rolls-Royce is focusing on individuals after the aero engine maker paid 671 million pounds ($870 million) in January to settle British, U.S. and Brazilian bribery investigations. David Green, the head of the SFO, told Reuters in an interview that he hoped a decision about charges would be made before he steps down after six years in the job next April. “I would expect resolution in both these cases in 2018, and hopefully prior to my departure in April,” he said. Separately, a spokeswoman for the Attorney General’s Office, which is responsible for SFO director appointments, said the recruitment process for Green’s successor had yet to begin. But she said there was “still plenty of time” and that there “will be an appointment in due course”. Prime Minister Theresa May’s Conservative Party pledged in May to abolish the specialist investigator and prosecutor and roll it into the four-year-old National Crime Agency (NCA) to “strengthen Britain’s response to white collar crime”. But the proposal drew sharp criticism from white collar crime lawyers, lawmakers and anti-corruption groups and was later dropped from the minority government’s official two-year policy program. Lawyers said the omission could signal a reprieve for the agency, which in June charged Barclays (BARC.L), one of the country’s biggest banks, and four former senior executives with fraud over undisclosed payments to Qatari investors in 2008. Paxil (Seroxat) Implicated In Steven DeValle Trial..
MARQUETTE, Mich. (WLUC) – Opening statements started day two in the Steven DeValle attempted murder trial in Marquette, also on the stand today, the victim. DeValle is charged with four counts, including strangulation and criminal sexual conduct against his ex-girlfriend last july. Prosecuting attorney Matt Wiese calling his first witness, the victim herself, who we are not naming or showing. In the prosecution’s opening statement, Prosecutor Matt Wiese told the jury to trust the evidence of those who were on the scene. He also established for the jury DeValle was unstable and capable of attempting to kill the victim. “He went from being enraged to being eerily calm and his mood she will tell you went in that way and when he became eerily calm is when she most feared for her life,” Prosecuting Attorney Matt Wiese said. In the defense’s opening statement, attorney Ted fulsher told the jury DeValle and the victim were recently in a 15 month relationship, having only just days before gone on a family vacation together. Fulsher told the jury about DeValle’s recent problems with mental issues, and of the recent switch in medication from Zoloft to Paxil. “Paxil has numerous side-effects,” Defense Attorney Ted Fulsher said. Those symptoms include, suicidal tendencies, erratic behavior and amnesia. After opening statements, Wiese called the victim to the stand as his first witness. The victim was asked when she saw a change in the defendant. “I started noticing maybe some anger tendencies and maybe some anxiety tendencies about 1:30AM,” the victim said. At that time, the victim says she messaged her police officer friend online to drive by and non-threateningly check in on them. The victim claimed she then dialed in 911, to have it available if she needed to call, before the defendant knocked the phone out of her hand. The defendant then became immediately concerned. “He got angry and started making comments, you know, you’re calling the police on me and you know if you do that I’ll lose everything,” the victim said. Wednesday, testimony from Forsyth Township Police and other medical personnel will be heard. MARQUETTE, Mich. (WLUC) – The Steven DeValle attempted murder trial entered its fourth day on Thursday July 27, with the defense calling a series of witnesses to the stand. The first witness was Steven DeValle’s step mother. After that, his ex-wife in Illinois then delivered testimony via video conference. Both women claim that DeValle has never had a history of violence or abuse. “As far as violence, that I know nothing of,” said Amy DeValle, ex-wife of the defendant. The defense then heard from the officer who found Steven DeValle on the side of the road July 6, 2016, the morning after the incident. The deputy from Delta County said that DeValle seemed depressed and suicidal, it was then that he brought him to Escanaba’s St. Francis hospital. The defense then submitted into evidence video of DeValle that morning when he was being arrested. In the video, DeValle appears manic, asking what he had done, claiming to have no memory of the incident. Next, the defense called to the stand pharmacist Tyler Jenema, who said that while the medicine DeValle was taking, Paxil, could change his behavior, it was very unlikely that he would suffer from memory loss because of the medicine. “The percentages are anywhere from half a percent or a little less, maybe up to one percent we think of patients maybe potentially experience amnesia,” said Jenema. DeValle himself then took the stand, staying firm to his claim that he suffered from memory loss, even when his stories started to change. His original testimony to Forsyth Officer, Chief Warchock claimed that he had no recollection of the night of July 5, 2016 after 6pm but in court DeValle claimed he remembered events up to 9pm and even 10pm. DeValle will continue to be examined and cross examined Friday, July 28 as the trial seems to be on track to that afternoon. Meds Like Seroxat (Paxil) Can Cause Violent Reactions.. The Royal College of psychiatry UK is currently under fire on Twitter from (what some of us see as) its biased ideological slant in regards to the benefits and risks of SSRI’s. Personally, I believe that the Royal college of Psychiatry knows full well that there can be severe risks to SSRI’s, but it simply cannot acknowledge them, because to do so would risk professional suicide. However, ironically, because psychiatry keeps on denying these serious side effects, it has already been committing professional suicide for quite some time. The internet, and social media in particular- has no mercy. Mainstream psychiatry has come under an onslaught of criticism online, mainly because patients, and patient advocates, are sick to our back teeth of psychiatry’s arrogant deflection, and deliberate promotion of misinformation. I have experienced horrible side effects of aggression, mania, akathsia, personality changes, and worse from the SSRI Seroxat/Paxil and there are thousands of others who have also. David Carmichael, 59, calmly and methodically describes the events leading up to the day he killed his 11‑year-old son Ian. Ian had epilepsy and very mild dyslexia, but had no problems other than being a little behind with his reading. David was a nurturing and devoted dad, a sports coach from Toronto, Canada, who’d spent his entire professional life working with children. But when David took Ian’s life during a psychotic episode, he was convinced that his wife Beth and daughter Gillian would thank him for getting rid of the ‘intolerable’ burden Ian had become. David was tried for first-degree murder, but the judge ruled he was ‘not criminally responsible on account of a mental disorder’. Two forensic psychiatrists diagnosed him as being in a ‘major depression with psychotic episodes’ when he killed Ian. David was sent to a psychiatric hospital where he spent four years. On December 4, 2009, he received an absolute discharge: a finding of guilt, but with no criminal record. It is a truly shocking and bitterly tragic story, and one that will divide opinion. David has always believed that his psychosis was caused by a type of antidepressant known as a selective serotonin re-uptake inhibitor (SSRI). But it has not yet been proven that SSRIs were to blame. David was taking paroxetine (sold as Paxil in the U.S. and called Seroxat in the UK). While the drugs appear to work for some people, SSRIs, like all medicines, can cause side-effects. Drowsiness, nausea, insomnia and loss of libido are some of the recognised ones. However, as Good Health has previously highlighted, there is growing concern about other SSRI side-effects such as anxiety, agitation, hallucinations and paranoid delusions, which, although more rare, can have a devastating impact. In these pages filmmaker Katinka Blackford Newman, a previously super-fit mother of two, has described her terrifying experiences. Hours after taking her first SSRI dose she became psychotic. ‘I didn’t harm my kids, Lily, now 15, and Oscar, now 14, but it still terrifies me that I might have done,’ she says. Tomorrow, Panorama takes up the story, asking: is it possible that a pill prescribed by your doctor can turn you into a killer? More than 60 million prescriptions for anti-depressants were written in the UK in 2015. Clearly very few people on them become suicidal or homicidal, but according to David Healy, a professor of psychiatry at Bangor University and a leading critic of SSRIs, as many as one in 1,000 people taking the medication is severely affected. ‘There are probably up to an extra 2,500 suicides in Europe triggered by an SSRI antidepressant,’ claims Professor Healy, who founded rxisk.org, a website that helps identify potential drug risks. Chillingly, he believes the figures are similar for episodes of violence, including mass killings. In March 2012, 28 Belgian and Dutch schoolchildren and teachers were killed when the coach they were travelling in drove into the wall of a tunnel. Investigators hired by the parents found that the driver was withdrawing from Seroxat. They believe he killed himself while suffering delirium caused by fluctuating levels of the drug. In the same year, at the premiere of a Batman film in Aurora, Colorado, James Holmes, a 24-year-old PhD student with no record of violence, murdered 12 people and injured 70. He is serving multiple life sentences in jail, but questions have been asked as to whether the SSRI he’d been prescribed played a part. Andreas Lubitz, the German pilot who on March 24, 2015, deliberately crashed a Germanwings flight into the French Alps, killing all 150 people on board, was taking antidepressants, including the SSRI mirtazapine. While no one knows for sure why SSRIs may adversely affect some people and not others, Professor Healy believes David Carmichael was ‘almost certainly’ in the grip of SSRI psychosis when he killed Ian. At the time, David was running sports camps while his wife stayed at home to look after their children. ‘I wanted to be the best worker, the best provider, the best father, and I stressed myself out to provide for my family,’ he tells me. This is a recognised side-effect of antidepressants and antipsychotics: statistics from clinical trials suggest that as many as one in 20 patients stops taking SSRI drugs because of agitation, with one in 100 experiencing hallucinations. But the agitation died down after ten days and David began to feel better within six weeks. But there were side-effects David didn’t like: excessive sweating, weight gain and sexual dysfunction. ‘These got me down, so I began to wean myself off,’ he says. He doesn’t know why he didn’t go back to the doctor. Nor does he know why he didn’t consult his doctor before taking them again a year later. ‘I felt the symptoms coming on again: I was anxious and I could feel my confidence drain away. Almost immediately, David began to feel agitated again. ‘I started to feel incredibly negative, and suicidal thoughts raced through my mind,’ he says. Thinking his depression was getting worse, he increased the dose to 60mg. ‘I believed it would help me recover more quickly, like taking two aspirin instead of one for a headache,’ he says. Over the next few days the akathisia subsided and, outwardly, David appeared to be functioning normally. David became convinced that he should end Ian’s life, too. ‘I felt strongly that it was my role as his dad to send him to a better place with me,’ he says. David describes a chilling state of calm as he worked his plan through. He decided to take Ian to the family’s weekend cottage where he would drown them both by going out in the family boat. But when he found he’d forgotten to pack his own bathing shorts, he changed his mind. ‘I’ve never been spiritual, and I don’t go to church, but I began to think that it was a message from God that I was not supposed to die, just Ian. ‘It’s still hard for me to believe I could have been in that mindset. But I really thought I was doing everyone a favour. I thought they’d understand. David decided to kill Ian with medication he bought specifically for that purpose from a chemist. The day after buying it, he calmly researched how much time he’d spend in prison for murder, and what jail would be like. 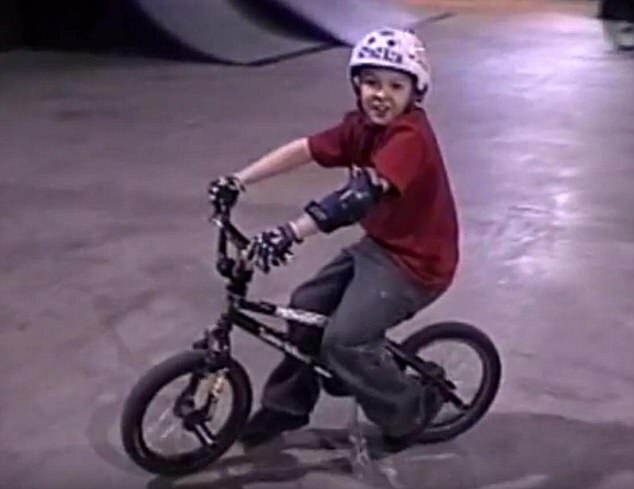 David arranged to take Ian on a trip to an indoor BMX park he knew his son would love, followed by a night in their favourite hotel in London, Ontario. The pair checked into the hotel on Saturday, July 30, ordering room service of all Ian’s favourite food and watching a superhero movie. All the while, David was fixated with the idea that he would sacrifice his freedom and go to prison for 25 years so Ian could go to a better place. ‘Nothing kicked in, no innate sense that I was doing the wrong thing,’ he says. Just after 10pm, he poured the medication into a glass of orange juice for Ian. But, instead of becoming sleepy, his son became agitated and began to hallucinate. At 3am David ‘very calmly’ strangled him. I remember every detail. It is as unbelievable to me as it is to you. But back then, I felt nothing other than a total conviction that everyone was going to thank me for what I’d done. When David was sure Ian was dead, he kissed him, told him he loved him and folded his hands over his chest. Then he watched TV ‘without any tears’ for six hours before calling emergency services. For two weeks, David remained in a psychotic state, with no comprehension of what he had done. CCTV from the police station shows him calmly shaking the hand of the pathologist who had attended the scene, as if nothing untoward had happened. When Beth was told that her son was dead and her husband was in custody, she collapsed, screaming. ‘A former boss came to see me and he said: “She will never forgive you.” I remember saying: “What? Of course she will! I did this for all of us,” ’ says David. David credits Gillian with saving his marriage ‘by loving us both’. David believes akathisia is the key to recognising a potential risk. ‘Anyone who has been prescribed SSRIs who becomes agitated and restless should be monitored closely and, if necessary, taken off the drug,’ he says. ‘If doctors screened patients for akathisia, lives could potentially be saved.’ David, who now volunteers with families dealing with loss, says he feels ‘a duty to speak out about the dangers of prescription drugs’. He has taken out a $20 million lawsuit against Glaxosmithkline, the maker of Seroxat, on the grounds of personal injury and product liability. ‘I believe there have been many, many deaths associated with Seroxat and I want to see the data on the table,’ says David. When he was discharged from the psychiatric institution, the community and some family shunned David. ‘People didn’t understand how anyone could take the life of a loved one, even when suffering from a mental illness. They still don’t.’ No one, he says, can punish him harder than he’s already punished himself. A spokesman for Glaxosmithkline said: ‘Mr Carmichael’s case is clearly a tragedy, but medicines like paroxetine are an important option for treating depression and have helped many people. ‘Patient safety is our priority and there is no scientific evidence that paroxetine causes homicidal, psychotic, or violent behaviour. The Pill That Steals Lives, by Katinka Blackford Newman (John Blake, £8.99). A Prescription for Murder? is on BBC1, at 9pm tomorrow.